Amid global economic woes and the fluctuating fortunes of China's economy, last year would hardly be considered the best time to launch a new bank, especially in a relatively remote area where only 3 million people live on a 1.2 million square kilometer plateau. The Urumqi State High-tech Zone in Urumqi, the capital of the Xinjiang Uygur autonomous region, held its opening ceremony for some transportation projects in the new area of the zone, on April 30, the Xinjiang website reported. About 5 kilometers southwest of Lhasa city proper, young plants burgeon on a Tibetan herb base set against a backdrop of snow-capped mountains. Tibet's economic growth jumped 12.2 percent year on year in the first quarter, up 0.8 percentage point from the same period last year, the autonomous region's statistics bureau said Wednesday. Hami city provides job skills trainings to more than 10,000 residents aged between 16 and 45 in rural areas to improve their chances of getting a job. The development in Tibet is China's top priority and Tibet is developing faster, Chinese Ambassador to Nepal Yang Houlan said here Friday. Tibet has provided 12, 700 new job offerings to the public in the past half year with an unemployment rate of 3.44 percent. 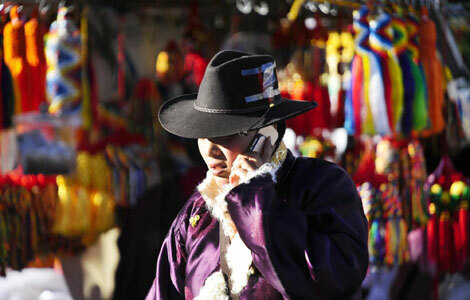 Private businesses in Tibet have seen robust foreign trade growth, reporting 1.71 billion US dollars of imports and exports in the first eight months this year, a year-on-year increase of 280 percent. State-owned enterprises at the central level will boost its investment in the energy sector of the Xinjiang Uygur autonomous region. Analysts estimate that the mining industry will account for one third of Tibet's gross domestic product and become the most important industry. Tibet's foreign trade continued to see robust growth this year as the government stepped up efforts to improve infrastructure in inland port cities and the efficiency of customs clearance, local authorities said. China's Tibet autonomous region saw its foreign trade up 170.3 percent year-on-year to $1.02 billion in in the first half of this year.